Robyn Miller took the stage at GDC in a baseball cap and hoodie, looking a bit like a celebrity who didn’t want to be recognized. “I never would have expected that twenty years ago, when we made Myst, anybody would be interested in it twenty years later,” he started. “This is pretty incredible.” A few slides into his talk, he realized he hadn’t introduced himself: “I should say—Rand Miller, my brother, and I’m Robyn Miller—we were the guys who made Myst.” He seemed surprised when the audience broke out in cheers. Robyn and Rand Miller, twenty years ago. “I don’t know where we got the idea for two brothers. It had to be subconscious on some level,” Robyn joked of Myst’s storyline. As they’d pitched in The Grey Summons, they knew they wanted to create a world that could be freely explored, a non-linear story with believable characters, more advanced graphics than their previous games, some sort of puzzles, and an ethical choice between right and wrong that the player would have to make. Beyond this, they hadn’t yet come up with any of the ideas that would become Myst, but they had some thoughts about how playing the game should feel. Their other brother had played a lot of Dungeons & Dragons growing up, and Rand and Robyn had observed firsthand the creativity and fun that emerged when a really good dungeon master was leading the story. “In fact, Rand created his own dungeon at one point in time, and what he threw out was rolling to create your characters, rolling for dexterity, rolling for strength,” Miller explained. “He said, ‘You guys are going to play this and just be yourselves, use your own intelligence, just observe within this universe.’ And in fact he never used dice at all, he just told people what they saw, within that universe.” The storytelling and sense of adventure that resulted was what they wanted to achieve in their new game. Rand Miller’s D&D dungeon. “When we were creating Myst, we got to the last age we were designing, the Mechanical Age, and we used this as a part of the design,” Robyn Miller said. Before jumping in on development, they playtested the game in a D&D fashion, with the “dungeon master” narrating scenes like: “You are standing at one end of a wooden dock. To your right, the mast of a sunken ship sticks out of the water. At the opposite end of the dock, a stone staircase rises to the top of a hillock, at the top of which rests a gigantic gear. A few steps away, at the base of the stairs, rests a contraption—about waist-high—you don’t know what it is. What do you do?” In this way, they were able to fine-tune the gameplay before getting too far into development. I’m sorry, but where is the post mortem? This is just a collection of tidbits about the development of Myst. Not uninteresting, but there’s not a single sentence from the brothers on what they’d do differently in retrospective, or what they think worked well and why. 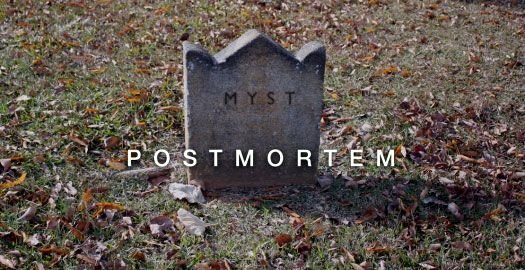 “Postmortem” is not how I would describe Myst…..it is still alive for those of us who lived the experience and yearn for more. Great article Emily. Bonsai: Its not just a name, its a type of article which outlines the pros and cons of the development. Its common in every industry. Postmortems do typically include a list of “what went right” and “what went wrong” with an eye toward “What could we do better next time?” In this case, however, it’s an article based on a talk from GDC, the title of the talk was “Myst Postmortem,” and the content of the talk is what’s covered in the article. I enjoyed your article very much, Emily. Getting glimpses into the development process from the germ of an idea to the fully realized game world I inhabited for many happy (and sometimes frustrating) hours is fascinating to me. Despite the depressing header pic, my love for Myst is still alive and well to this day. Thanks for bringing us insight into the creation of one of the finest games ever made.